They fail to earn enough traffic, leads, customers, users, and subscribers. The phone isn’t ringing. Lack of deal flow and revenue from poor lead and value generation is the cause. And of the businesses still operating, nearly all of them want more. Because what they are currently getting is simply not enough. Growth hacking — and automating your marketing outreach through social media channels such as Instagram — is one of the most effective and powerful techniques to create a non-stop stream of fans, prospects, followers, and leads for your business. While the free workshops provide a grand strategic overview, Danny has created a one-day curriculum where participants can get more intensive “hands-on” help, and get SIX TIMES the value and content of the normal workshops. You will literally get front-row access to ALL of our business systems… and learn how to growth hack every media platform and niche, so that your business’ future is secured. You will never struggle with attracting and converting customers ever again. In this special one-day intensive, you’ll get on the fast track and learn the insider secrets of successful veteran entrepreneurs. It’s one thing to be shown or told how to do something — it’s another to have one-on-one personalized help and be led through every step of the process to get everything your startup or online business needs to succeed. This is a course for serious entrepreneurs. Do not come if you are not ready. You need to be hungry, ready, and willing to grow your business to new heights — and reach the next level of success and fulfillment. Each workshop attendee will receive a five-year guarantee: if you attend this workshop, follow the material, use it, and it doesn’t immediately get you new customers and change your business (and life) forever, send an email to the instructors any time between now and 2022 and we will happily refund your money via electronic transfer. Why attend a paid growth hacking intensive? Why not attend one of the free workshops? While you can gain a lot of killer insight and tools from Danny’s free workshops, some attendees want to go even further. They want to get on the fast track and learn the insider secrets of successful veteran entrepreneurs. It’s one thing to be shown or told how to do something — it’s another to have hand-holding, one-on-one personalized help to actually do everything your startup or online business needs to succeed. We will be led you through every step of the process. Tom James is a world-renowned marketer, known mostly for his paid advertising expertise. He has spent over $10m in Ad Spend on behalf of clients. Tom runs a specialist agency that helps anyone, from first-time entrepreneurs to public companies, implement sustainable strategies for growth – taking entrepreneurs from 0 to 1000 users, or companies from $100k to $1m revenue. He wants to educate new companies and entrepreneurs, not only how they can use cheap marketing to boost their growth, but also how they can easily implement cheap paid advertising methods that build a sustainable and scalable growth strategy for long term success (and make back more money than they cost). He has worked with over 300 clients personally and even more have used his content and lessons to boost their growth. Originally from the UK, Tom has lived in over 50 countries, and rarely spends more than a week in one place – he can often be found on a beach somewhere in Asia! He likes to work with clients that are ready to scale fast but need his help to bring them growth. Tom is a big advocate of a company making money as they grow so that they can fund future growth. He often achieves over 5x ROI for eCom clients, and up to 500x ROI for certain companies! 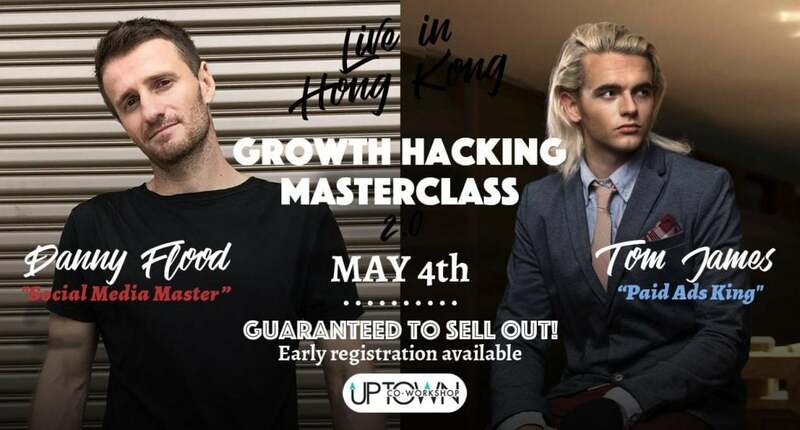 Danny Flood is the multiple best-selling authors of “Dr Growth,” speaker, and one of the world’s most sought-after growth hackers. He has spoken in front of crowds in Singapore, Hong Kong, Jakarta, Bangkok, Mumbai, Bangalore, Kuala Lumpur, Seoul, Los Angeles, and many other cities. Thousands have come to his live events around the globe and have used his growth hacks to completely transform their businesses. Danny began his first business operation in earnest, knocking on doors at age 9. In 2012, he was the #1 door-to-door canvasser in Nevada during the Obama presidential re-election campaign. In addition to marketing, he has been a student of how the brain works for more than 23 years, giving him an important insight into why things that “should work” (from a practical standpoint) fall flat when pitted up against human nature.